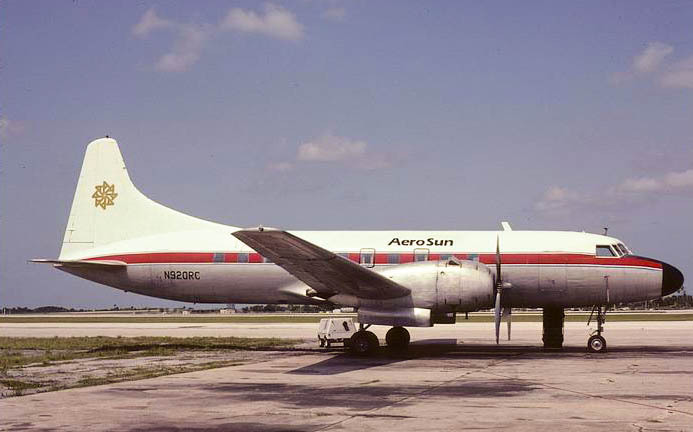 Formerly known as Red Carpet Airlines, AeroSun served Miami, Tampa, Key West, and the Cayman Islands during 1981 and 1982 with a fleet of Convair 440s, Douglas DC-3s, and Piper Navajos. Below: AeroSun International's Convair 440 N920RC (msn 118). An AeroSun International timetable effective April 26, 1982 showing domestic flights on one side and international service on the back. Thanks to Arthur Na for these scans. For additional timetable images and information, visit the AeroSun page at Timetable Images.